if you're like me, you like s'mores more for the experience of the fire and the friends, than the actual taste. the chocolate never melts enough, the marshmallow is always sticky and messy and the graham crackers fall apart with every bite. 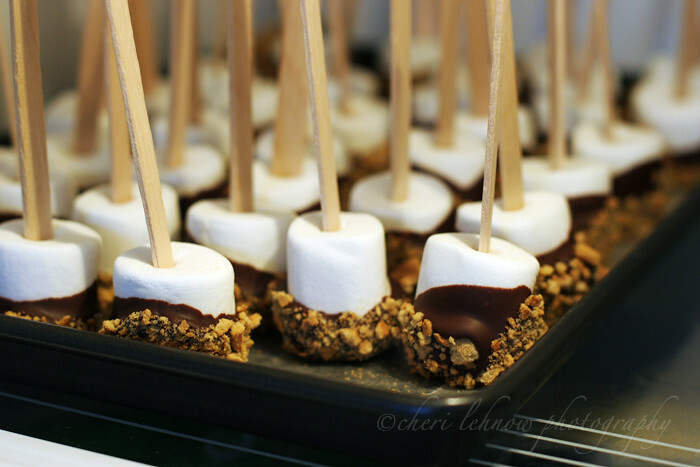 well, let me introduce you to s'mores on a stick. i think i ran across this on a blog while i was prepping for my party, and i just had to make them. really REALLY simple to make. start with a bag of marshmallows, a bag of semi-sweet chocolate chips and a box of graham crackers. 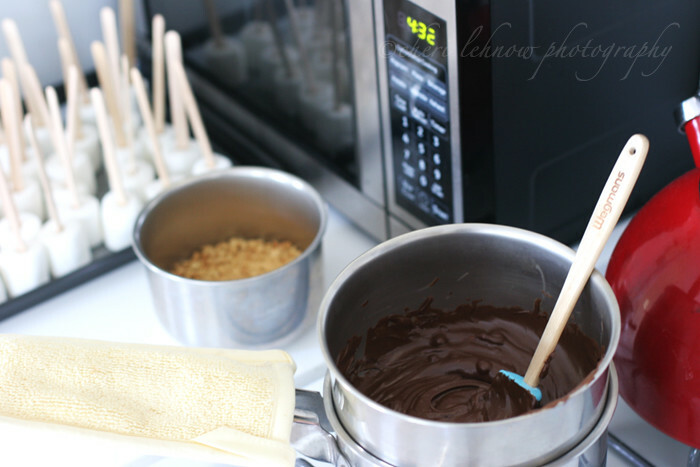 melt the chocolate with a double burner or if you don't have one just a metal bowl inside a pan like me. crush the crackers and have them at the ready, about 6 squares. put sticks in each marshmallow. then once everything's ready start dipping and coating. refrigerate to set the chocolate. SO easy and pretty tasty. plus, mess free. this would probably be great for little hands. I am loving the food posts! These are adorable and a fun grown-up way to enjoy a classic treat. I have to make these (minus the nuts for Jack of course, I bet sprinkles would be cute too). I have made these at Christmas time with red and green metled chocolate and sprinkles, and called them sugar plum treats, and wrapped each one in a little plastic bag and tied with a ribbon. My kids love anything on a stick. Those cakes, muffins,what are they? with the cherries on top looked great too. We are going to the cottage this weekend so am buying s'more stuff anyway. Think I'll make your version for Wed. night-I teach Patch the Pirate Club and am always looking for fun snacks! Thanks!